Groundwater is a strategic resource for agricultural production across the world, accounting for 33% of total water abstraction worldwide and half of the irrigation water used to grow the world’s food. It plays a crucial for water and food security and the economic development of rural areas in many regions of the world. Yet, groundwater resources are being over-exploited at an alarming rate, threatening the sustainability of rural economies. Future resilience will be dependent on the ability of farming communities to adapt to a changing water resource base while fostering a competitive, innovative and dynamic rural economy. The European Union H2020 funded RURECO project focuses on strategies and institutional arrangements for sustainable groundwater management. Research involves international comparison of groundwater allocation policies in agriculture, including France, Spain and California. The project also aims to develop participatory foresight methods to strengthen the resilience of agricultural communities dependent on groundwater extraction for irrigation purposes. As part of RURECO, Associate Fellow Dr. Josselin Rouillard, currently in secondment at the French Geological Survey (Brgm), recently took part in a one-month research exchange at the Center for Watershed Sciences at the University of Davis, California. Seminars with academic staff at UC Davis and Stanford University were organised comparing European and Californian strategies for sustainable groundwater management. Workshops and meetings were organised with the State Water Resource Control Board and nine groundwater sustainable agencies across the state of California. These exchanges reinforce a long history of transatlantic exchange between Ecologic Institute and the United States. Although France and California have very different physical realities and histories of managing groundwater, they all face significant challenges regarding the good quantitative status of their groundwater resources. Innovative approaches are being trialled in both regions, providing useful ground for international comparison and lesson drawing. A synthesis of key observations on European, French and Californian experiences made during the research visit is available in this blog post. Rouillard, Josselin 2019: Groundwater and agriculture: a comparison of managing scarcity and droughts in France and California. 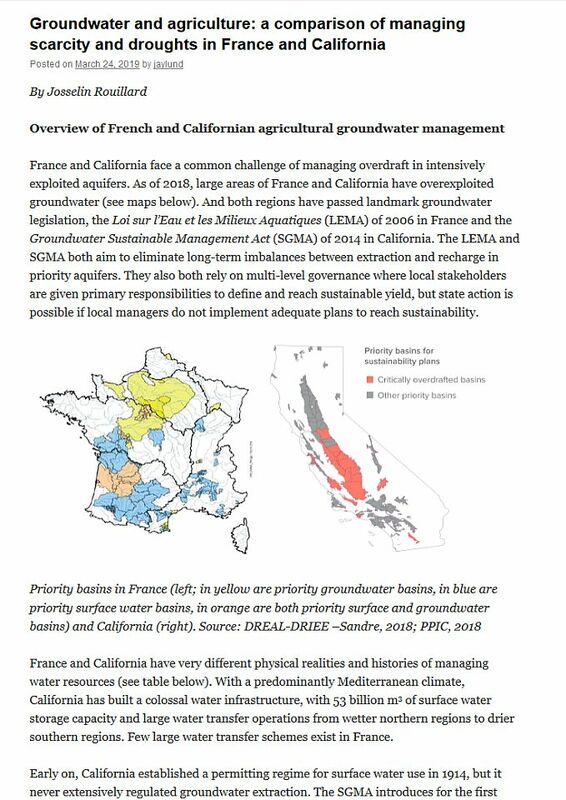 California WaterBlog, 24 March 2019, https://californiawaterblog.com/2019/03/24/groundwater-and-agriculture-a-comparison-of-managing-scarcity-and-droughts-in-france-and-california/.